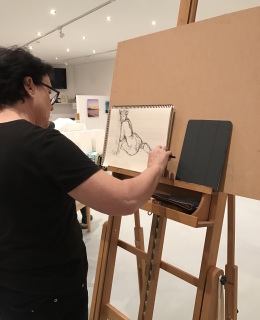 Enjoy untutored & tutored life drawing on Saturday 11 May, 2019 at our air-conditioned Norman Park studio. Starts at 2pm and finishes at 4.30pm. The model will be asked to pose for tutored participants within the times, but this will not hinder the self paced artist as times will be short to long as normally done during a Life Drawing session. Bookings and payment in advance are essential as numbers will be capped at 12 participants so book in early (week in advance is recommended). Please let us know if you prefer an easel or table when you book your place. Cost will be $25 for untutored and $35 for tutored participants. Coffee & tea is provided with biscuits and the studio is fully air conditioned for your comfort.